GATE 2019 Hall Ticket: Hello, aspirants as we all know that the IIT Madras is going to conduct the next year GATE 2019 Exam. The official notification of GATE 2019 Examination has been released by IIT Madras on 6 August 2018, and according to the notification, the GATE 2019 admit card will be released on 4th January 2018. The admit card link will be released on the official website. The link will be shared with the Aspirants through his/her registered email ID and mobile number. Candidates can download admit card by login the official website. The exam will be conducted on next year, for 24 subjects on February 2, 3, 9 and 10 in Computer Based Mode. Throughout the article, we will provide you with the detail information about GATE 2019 Admit card and how to download the admit card in Just a few second. 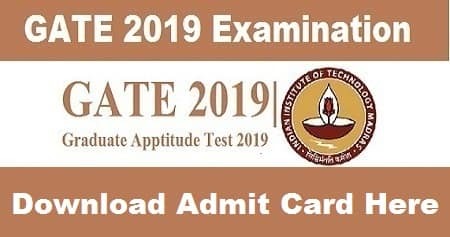 Before we talk about the GATE 2019 Admit card in details lets have a look at the GATE 2019 Important Date and the complete Schedule of GATE 2019 Examination. The online form filling process for GATE 2019 will be Starts from 1st September 2018 and the last date of submitting online application form is 21st September 2018. The Complete GATE examination Schedule is Published Below. The GATE 2019 Admit card will be released on 4th January 2019. The link of GATE 2019 Admit card will be notified on the official website of GOAPS. The link will be shared with the Aspirants through his/her registered email ID and mobile number. The procedure to download GATE 2018 Admit Card is very simple. Follow the instruction given below and you can easily download your admit card in just seconds. GATE admit card will be valid only if the candidate’s photograph and signature are clear and legible. To ensure this, the candidates must have a coloured printout copy of their admit card. Applying Candidates are requested to report at the examination venue 60 minutes before the exam starts. Candidates are not allowed to enter in the examination hall after 9.30 am. Candidates will be allowed to settle down on their allotted seats 45 minutes before scheduled start of the exam. The Aspirants will have to log in and start reading all of the instructions 20 minutes before the examination Starts. Until the examination ends, the aspirants will not be permitted to leave the examination hall. A virtual scientific calculator will be available on the computer screen during the exam. Candidates will not be allowed to bring any charts/tables/papers and any electronic device like Personal calculators, mobile phones, watches or any other electronic devices will not be allowed in the examination hall. For rough work, the candidates will be provided with scribble pads. In case of any discrepancy noticed in admit card regarding particulars of the candidate, photograph, and signature or any other information varies from confirmation page, he/she may immediately contact the GATE Examination Board unit for necessary corrections. proof of payment of fee i.e. candidate copy of E-Challan, if payment made through E-Challan or a copy of bank statement, if payment made through Credit/Debit Card for considering his/her candidature for GATE 2019 Examination. Aspirants May Also Check these Important links related to GATE 2018 Examination. For any Query related to GATE 2018, comment on the comment box mentioned below. Our expert will help you to make the Best preparation Strategy for GATE Entrance Examination.